Covering more than 200 judgements from Australian courts over the last two years, Expert Evidence: Recent Cases discusses significant decisions and developments from the unique perspective of those providing and preparing expert evidence. KordaMentha Forensic have continued the format established in the first edition of Expert Evidence, reviewing over 2,500 recent cases from Australian courts to identify judgments relating to the principles of expert evidence and emerging trends in this area of the law. 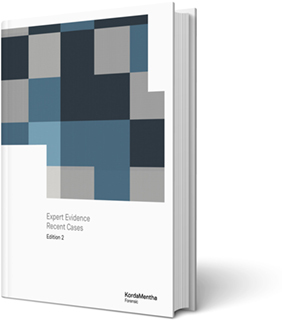 Expert Evidence: Recent Cases Edition 2 summarises over 200 judgments relating to expert evidence and presents 40 case reviews discussing the facts, issues and potential relevance to this area of law and practice. Register to receive the Expert Evidence: Recent Cases Edition 2 eBook. By clicking on the submit button, you acknowledge that you have read the Privacy Statement. Andrew has assisted Australian and international clients involved in complex commercial disputes. His thorough analysis and clear communication helps clients and their opponents come to grips with the critical financial aspects of their disputes. He specialises in valuations of shares, businesses and assets, the preparation of expert reports and provision of expert evidence and acting as a court-appointed referee or party-appointed expert determinator. Ben has over 10 years’ experience in forensic accounting, business valuations and data analytics. He uses his technology skills to develop efficient solutions to complex questions or issues. Ben has prepared expert evidence for use in proceedings in the Supreme Court of New South Wales and Western Australia. He has co-authored the forensic accounting chapter in the 2018 update to Expert Evidence: 75 expert areas. Anh has nine years’ experience in forensic accounting, valuation and damages assessment and has been engaged as an expert witness in the Supreme Court of NSW. He also prepares expert witness reports for various supreme courts and the Federal Court of Australia. He has co-authored the forensic accounting chapter in the 2018 update to Expert Evidence: 75 expert areas. Emily has four years’ experience and has assisted in the preparation of expert witness reports submitted in various Australian Courts. She has experience in accounting and fraud investigations, asset tracing and funds flow analysis, economic loss assessments and forensic reviews.